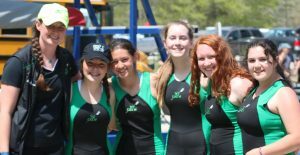 Yesterday saw a great day of racing for the team on the Occoquan. We entered four women's 4s, a women's 8 and two men's 8s. Much of the squad saw great improvements over their pieces at the Bladensburg Invitational. The highlights of the day were the Women's Junior 8, who dominated their heat on the way to a second place finish to TC Williams in the Final, as well as the Women's Novice 4, who came in third in a close race that had all four boats separated by 3.8 seconds. The girl's Second 4 and Junior 4 both advanced to Finals, while the Men's 8s put on good performances against some tough regional competition. The men's second 8 laid down their best time of the season, with 6 Freshman in the boat. Special thanks goes to all the drivers and parents who supported the teams efforts, especially the food crew: Christie, Jill, Carlos, Ann, Valerie, and Judy. Also, thanks to Madeleine and Ilmiya for providing snacks for our Spring Break double practices. We have just over a month left in the season, and the coaching staff is really looking forward to the coming weeks!